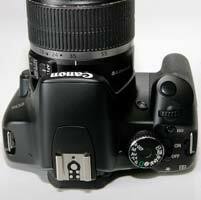 The Canon EOS 450D is outwardly very similar to its predecessor, the EOS 400D, with a few smoother edges and rounded corners. It's actually slightly bigger in all dimensions (128.8 x 97.5 x 61.9 mm), but slightly lighter in weight at less than 500g. The plastic outer shell has a more refined finish and there's some new textured areas on the hand-grip and thumb-rest on the rear of the camera. Holding the camera is a little fiddly because the EOS 450D's comparatively small body size means that the grip isn't particularly deep and people with large hands (like me) may find that their little finger has nowhere to go. The most obvious difference is the larger 3 inch LCD screen, which has necessitated the removal of the vertical row of 5 buttons as found on the EOS 400D, which have now been dispersed around the rest of the camera. The Canon EOS 450D looks and feels more expensive than it is actually is, and is certainly solid enough for an entry-level DSLR. I tested the EOS 450D with the new EFS 18-55mm f/3.5-5.6 IS kit lens, which offers the same range as the standard lens shipped with the 400D but crucially adds image stabilisation. This is important for Canon, as competitors like Sony, Olympus and Pentax all offer image stabilisation in their DSLRs. The difference between Canon (and Nikon) and the others is that Sony, Olympus and Pentax have opted for stabilisation via the camera body, rather than the lens, which therefore works with their entire range of lenses. Canon's system is obviously limited by which lenses you choose, but it does offer the slight advantage of showing the stabilising effect through the viewfinder. Canon and Nikon also claim that a lens-based anti-shake system is inherently better too, but the jury's out on that one. My review of the EOS 450D was delayed by a malfunctioning EFS 18-55mm lens which refused to auto-focus properly, despite the camera claiming otherwise. Thankfully the second one actually worked, and the image stabilisation is undoubtedly a real boon for low-light photography. Like most entry-level DSLRs the EOS 450D provides a number of auto shooting modes aimed at beginners, including portrait, landscape, close-up, sports and night portrait and flash off choices. All of these functions performed adequately in all aspects, apart from the close-up macro mode that did not come near to offering a true 1:1 reproduction (you'll need a dedicated macro lens for that). 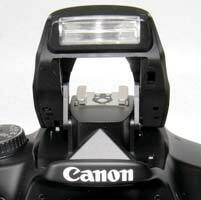 There are, of course, manual and semi-automatic modes for users who want more advanced exposure control. Canon refers to these advanced operations as the 'creative zone' and provides all the normal settings including Program, Aperture and Shutter Priority and the full manual mode. Additionally, they provide the 'A-DEP' (Automatic Depth of Field) function that gives a wider depth of field between a near and far subject. Once the EOS 450D is in the 'creative zone' users can adjust the ISO setting into one of five positions from 100 to 1600 which is more than adequate for most lighting conditions, although I'm not sure why Canon didn't include an ISO 3200 setting, given the excellent image quality at ISO 1600. The EOS 450D also offers a range of three Auto focus modes (One Shot, AI Focus and AI Servo) and there's also a new 9-point wide-area AF system with f/2.8 cross-type centre point. There are six preset, auto and custom white balance options, and Canon have added a Spot mode, covering 4% of the viewfinder, to the other three metering modes, which is a very useful addition for more experienced photographers. The viewfinder now displays all key exposure information including ISO speed. 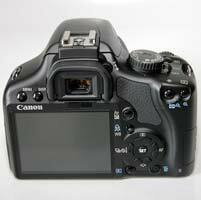 Most of the 450D's buttons are located logically on the rear of the camera, although the larger 3 inch screen has made the overall layout more complicated. It offers quick access to the Continuous modes, Auto Focus, Metering modes and Picture Styles via its circular four-way controller. There's a new ISO button on top of the camera near the aperture/shutter speed control dial, which provides easier access when looking through the viewfinder. Aperture and shutter speed settings can be easily adjusted with the index finger on the well-positioned dial, but it's annoying that you have to hold down the Exposure Compensation button to change the aperture in Manual mode, rather than just press it once to toggle between shutter speed and aperture. Live View is a brand new addition to Canon's consumer DSLR range. If you're new to DSLRs and don't understand the terminology, basically Live View allows you to view the scene in front of you live on the LCD screen, rather than through the traditional optical viewfinder. This is an obvious attraction for compact camera users, who are familiar with holding the camera at arm's length and composing via the LCD screen. It's also appealing to macro shooters, for example, as it's often easier to view the screen than look through the viewfinder when the camera is mounted on a tripod at an awkward angle. Live View is annoyingly difficult to actually turn on, as Canon have inexplicably buried it in the menu system. Once enabled, Live View is activated by pressing the Set button on the rear of the camera. A grid line display and very useful live histogram can be enabled to help with composition and exposure, and you can zoom in by up to 10x magnification of the image displayed on the LCD screen. 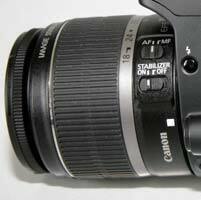 Focusing is achieved via the AF / AE Lock button, rather than half-pressing the shutter-button. Live View can also be controlled remotely using the supplied EOS utility software, which allows you to adjust settings and capture the image from a PC. So who does the EOS 450D's Live View mode most appeal to? Well, it attempts to satisfy both the consumer and more technical user, with two types of focusing system on offer. The first, Quick AF, is very similar to the EOS 40D's, working by physically flipping the camera mirror to engage the auto-focus sensor, which then momentarily blanks the LCD screen and causes a physical sound, before the image is displayed after about 1 second. The other method, Live AF, uses an image contrast auto-focus system, much like that used by point-and shoot compacts, the main benefits being the complete lack of noise during operation, and no LCD blackout. Unfortunately this is much slower than the Quick AF mode, taking over 3 seconds to focus on a clearly-defined subject in bright light, which I think will put off most users that are attracted by the promised point-and-shoot experience. Canon has embraced dust-removal technology, where the sensor is shaken briefly at high frequency to � hopefully � dislodge any dust particles from its surface. This could delay the need for manual sensor cleaning, perhaps indefinitely, but it won't be able to remove �sticky' deposits like salt spray, pollen or the smears left behind by careless sensor cleaning or the wrong kind of solvent. 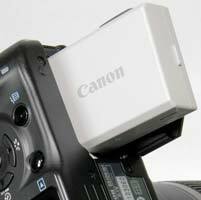 Canon has also developed a new internal Dust Delete Data system (as seen on the EOS 40D), which can map the position of visible dust on the sensor. This can then be deleted automatically after the shoot with the supplied Digital Photo Professional software. Or so Canon claim - I found that DPP often refused to even acknowledge the dust particles that had been identified, never mind delete them. The menu system has been completely revised. The EOS 450D now uses a menu system inherited from the professional EOS cameras, with a simplified tab structure that does away completely with scrolling. There are 7 tabs, with up to 7 options in each one, providing quick and easy access to the various options. You can even setup your own customised menu page for instant access to frequently used settings via the new My Menu tab. Pressing the Display button when using the Menu system displays all of the camera's current key menu settings laid-out for easy viewing on the LCD screen. There's an impressive choice of eight different image quality modes and there are also useful tools like a red-eye reduction option and the usual custom white balance option and flash exposure compensation. The new LP-E5 battery pack is smaller than the EOS 400D's, and also has a higher capacity of 1080mAh. This extends shooting time on a single charge to a claimed maximum of 500 shots - I managed around 400 before the battery icon started flashing. Also new is the change from CompactFlash to SD memory cards, which with bigger, faster and cheaper SD cards available, makes perfect sense for the market that Canon is targeting. If you have never used a digital camera before, or you're upgrading from a more basic model, reading the comprehensive but relatively easy-to-follow manual before you start is a good idea. Thankfully Canon have chosen to supply it in printed format, rather than as a PDF on a CD, so you can also carry it with you. The start-up time of the Canon EOS 450D, from turning the camera on to being ready to take a photo, is very quick for at around 1 second. Focusing is blazingly quick and very consistent in good light with the standard 18-55mm kit lens, with the wide-area 9-point AF system offering generous scene coverage, and the camera happily achieves focus indoors and in low-light situations. It takes less than a second to store a JPEG image at the highest quality setting with no discernible lockup between taking shots, allowing you to keep shooting as they are being recorded onto the memory card. For RAW images the Canon EOS 450D is impressively just as quick, again with no discernible lockup between shots. In the continuous shooting mode you can hold down the shutter button and take 3.5 shots per second for up to 53 JPEGS, 6 RAW files, impressive for an entry-level model. All in all a great performance given the large 12 megapixel files that this camera produces. The new, larger 3 inch LCD screen gives a very good, clear view of your pictures, and when compared to the older 400D, the new screen provides accurate feedback on a picture's exposure and color reproduction from a much wider viewing angle. It still only has 230,000 pixels, but the larger screen is a great way to show off your images to friends and family, and will therefore definitely appeal to its target audience. By default, the current camera settings are displayed on the LCD screen. This can be turned off by pressing the Display button, and there's also a new handy sensor underneath the viewfinder, which detects that you're looking through it and turns off the LCD display to both save power and stop it from distracting you (this can be enabled or disabled in the main menu). The Canon EOS 450D's software suite is very good. Admittedly, photographers who've graduated to a camera like this one will almost certainly have chosen image browsing and editing software already, so they won't need the basic image browsing program included here, but there's more than that. You also get Canon's simple but effective PhotoStitch application for making panoramic shots, a utility for using the 450D remotely (while tethered to a PC) and Canon's Digital Photo Professional application for converting RAW files. This is a big bonus, because other makers don't always include such good RAW conversion software. Digital Photo Professional isn't the best RAW converter on the market, and Adobe Lightroom, for example (which already supports the 450D) does a much better job of recovering bright highlight detail, which is one of the main reasons for shooting RAW files in the first place. But what DPP can do is mimic the camera's Picture Styles �retrospectively'. For example, the Landscape mode is great for deepening blue skies but it can be a bit over the top with other subjects. Instead of committing to this mode when shooting JPEGs, you can shoot RAW and change your mind later. In addition the supplied Picture Style Editor software can be used to create custom Picture Styles on your computer instead of in-camera. Once you have captured a photo, the Canon EOS 450D has an average range of options for playing, reviewing and managing your images. 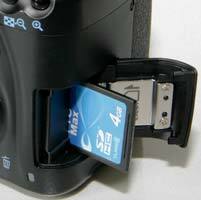 More information about a captured image can be seen on the LCD by pressing the DISP. button, which brings up an image histogram and all the shooting Exif data, including shutter speed and the time and date it was captured, with a second press displaying an additional RGB histogram. It is simple to get a closer look at an image as users can zoom in up to 15 times, and it is also possible to view pictures in a set of nine contact sheet. You can also delete an image, rotate an image, view a slideshow, protect images so that they cannot be deleted, and set various printing options. Unlike some competitors, there are no digital styles or effects that can be applied to an image after it has been taken - the more subtle Picture Styles are the only way of tweaking your JPEGs in-camera. The camera shows you a preview of what the effect will look like when applied, and the effect is applied to a copy of your image, thus preserving the original intact. In summary the Canon EOS 450D is very similar to the previous 400D model - an all-plastic but well-built, intuitive and very responsive DSLR - with some thoughtful improvements that make an already excellent camera even better. The only notable fly in the ointment is the Live View mode, which will appeal to more experienced photographers who require technical control, but probably not to the user who wants a point-and-shoot experience via the LCD screen. PhotographyBLOG is a member of the DIWA organisation. Our test results for the Canon EOS 450D have been submitted to DIWA for comparison with test results for different samples of the same camera model supplied by other DIWA member sites.